Vrindavan (Uttar Pradesh), Dec 26 (IANS) Even as preparations are underway here for a large religious festival starting next month, eco-activists led by former director general of police K.P.S. Gill and working under the Save Yamuna to Save Vrindavan campaign have demanded rethinking on building a new bridge at the heritage Keshi Ghat. Though district authorities are working overtime to ensure that basic civic infrastructure is ready by early January for the festival they call a Kumbh Mela, leaders of various Akharas (Hindu sects) in Vrindavan are not satisfied with the state of preparedness. “Time is running out and our chief worry is the sad state of river Yamuna,” a sadhu near the Keshi Ghat said. In order to pursue money which is like honey for almost everyone, certain individuals and political bodies do not care for the destruction of historical or religious sites. Thus the building of a bridge across Yamuna takes place. Many devotees and well-wishers are protesting. This will bring about an ecological destruction of the Kesi Ghat area. Here we are trying to preserve what is ours, yet there are those who are bent on seeing it go forever. 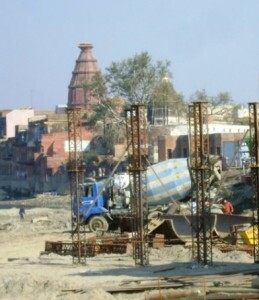 The government of Uttar Pradesh, along with private contractors, has begun construction of a bridge that will cross Vrindavan’s Yamuna River in close proximity to the historic Kesi Ghat. The project is an effort to facilitate further growth in the area, nearby parts of which are already overwhelmed with buildings and people, particularly during certain times of the year in which pilgrims from all over the world flood Vrindavan to celebrate and honor various holidays. In recent days it seems that the issue is coming to a head with many devotees and environmental activists speaking out against the construction. One of the more prominent voices involved in the protest is that of K.P.S. Gill, former director general of police, who has previously been credited for cleaning up and helping to reduce crime in the area surrounding Kesi Ghat. On Dec. 25, a few hundred persons, mostly from Vrindavan’s religious community, including many foreigners from several maths and ashrams, gathered at Vrindavan’s Keshi Ghat to protest the building of a bridge. This bridge, which loops around the ancient redstone ghat, will permit car traffic to make the full tour of Vrindavan, turning the Parikrama Marg into a Ring Road. With respect to all citizens and members of the administration, we invite you to give your support to a Vrindavan with a clean Yamuna river and without a bridge in front of Keshi Ghat. We have to find a solution to the many problems the growing city of Vrindavan is facing. Some past mistakes due too insufficient research have to be corrected. We need the participation of all. It is the time to save the wonderful old ghats and accommodate the new growth of traffic to the holy Dham. Please sign this petition to show your support for the beautiful Vrindavan every pilgrim and Brijbasi deserves to see. The holy Yamuna is in need of active support. By Signing the petition, you will show your keen interest that the administration and local environmentalists work together.